French: Opossum aquatique; German: Schwimmbeutler; Spanish: Tlacuache de agua, cuica de agua, yapok, zorro de agua, comadreja de agua. Length 10.6-15.7 in (27-40 cm); weight 21.2-28 oz (600-790 g). 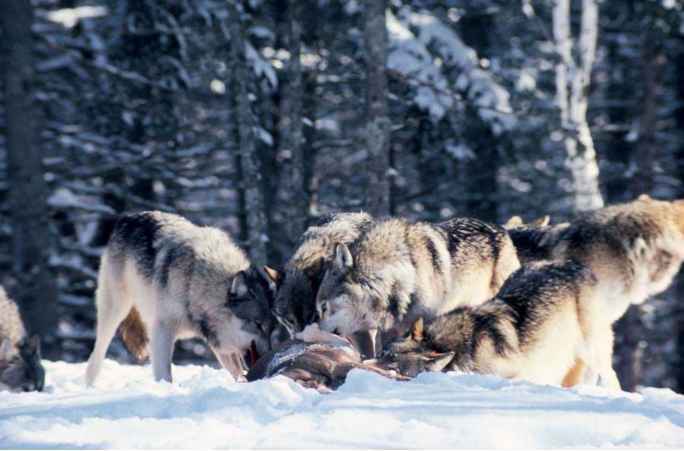 Dense and silky hair with four to five broad dark brown bands across the back joined along the dorsal spine. Venter is silvery white and tail is almost naked and scaly. The eyes are large and black, and the face has another dark band across the eyes. The tail is slightly flattened laterally and bicolored, with the distant half whitish. The toes are clearly webbed to aid in swimming. Southern Mexico, through Central America, Colombia, Venezuela, Guyana, Suriname, French Guiana, Ecuador, Peru, Brazil, Bolivia, Paraguay, and Argentina. Rivers and streams in primary lowland tropical moist forest, generally from sea level up to about 3,300 ft (1,000 m), although it has been found at 6,230 ft (1,900 m). A solitary species that swims under water to avoid danger. It is primarily nocturnal, secretive, and silent. Feeds mainly on fish, crustaceans, and mollusks. This is the most carnivorous of the New World opossums. Polygamous. The female constructs a den on the bank of a river or stream where she builds a nest with vegetation. The young are born very undeveloped after a short gestation. The female keeps the young in a well-developed pouch that closes hermetically when she swims. The male also has a marsupium to protect the testicles. 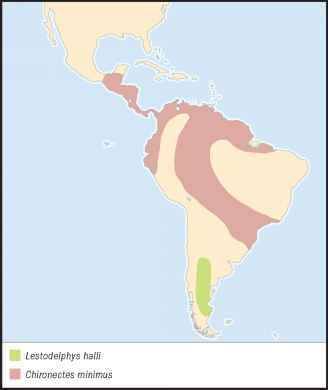 Considered Lower Risk/Near Threatened by the IUCN, but the water opossum has disappeared from many areas in its historical distribution. Deforestation and water pollution are two factors that determine their local extinction.